It’s 04:21 in the morning of the 6th of April. The operation here at the port of Lorient La Base is about to begin, the excitement is growing. 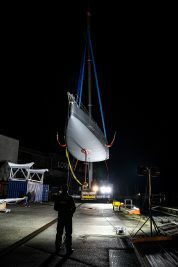 The blue belts come tight as the crane starts lifting Malizia out of the yacht’s cradle. There she is, looking like new: The light grey coloured hull gleaming like silver; the branding Yacht Club de Monaco finely drawn in white; the keel, foils and rudders shining in bright Monaco red. Finally, after five months of extensive refit and thousands of working hours in the boatyard, Malizia is ready to sail or rather ready to take off, in view of the impressive set of foils. Before the sun rises on this cold Saturday morning, our IMOCA 60 touches water for the first time this year – in perfect shape. A lot of work has been done over the winter by Team Malizia’s shore crew – Stuart, Mike, Shane, Robin and Ryan – to get the boat in mint condition. But what exactly has been done on board? Here is the answer. Over the past five months, Malizia was basically completely taken apart. Let us start with the appendices: The rudders were demounted and underwent an MRI (Magnetic Resonance Imaging) scan to check for any damage that cannot be noticed with the naked eye. At the same time, a major overhaul was done to the rudder system in order to fix the wear and tear, and movement it had created over time. The foils were demounted and thoroughly checked, too. After extensive examination, the rudders and foils were repainted, wet-sanded, polished and remounted before the boat went back on keel. Speaking of the keel: It was completely disassembled, meaning the bulb was detached from the fin and the barrel fairings were removed, so that its components could be X-rayed and checked for cracks and any possible damage or material fatigue. Following the excellent test results, the team reassembled the keel and applied paint in several layers. Finally, the keel’s reattachment to the boat happened just before leaving the shed. In the context of modifications within the IMOCA Class rule affecting the righting moment, the limiters of the keel ram were adapted accordingly, so that the keel can now cant more (from 32° to 38°). There have also been some changes concerning the boat’s centre of gravity: Some of the ballast tanks could not be used anymore and were cut out; the aft ballast tank holds a reduced quantity of water from now on. The mast was fully serviced and underwent an ultrasound, along with certain critical areas of the boat and its structure – again the results were very good. All the mast’s fittings were checked and serviced, a new stay was installed, and new halyard strops were made. Equipment service and maintenance were major points during the refit process. All the deck hardware was removed – from the winches, blocks, pad-eyes up to the last screw of the deflection rollers. Malizia was externally and internally almost fully stripped of gear for service, modification or replacement, and finally every single piece had to be reinstalled on the boat. Below deck, there were additionally a series of works concerning the boat’s electronics to be performed: The team has fully redesigned and engineered the generator charging system, which is now easier to handle and offers the highest reliability. On top of that, with the help of SOLBIAN Solar nearly 9m² of solar panels were installed on board, including all the cabling and regulator boxes for the respective output control. For a full review of the new solar system on board, click here. In the meantime, the bowsprit was modified so as to be able to hoist two headsails in line from now on and thus facilitate sail handling at sea. The whole boat and deck surfaces were finally sanded and newly painted, which was done by contractors. At the moment, the team is performing a series of sea trials off the coast of Brittany and testing extensively every single component and system on board. “We have done quite a few changes to the boat. In general, we are always looking to make it more reliable, we updated a lot of the deck fittings, the ropes are stronger and all kinds of little details. In addition to that, we installed a big solar generator. We have more autonomy now and are more independent from generating energy with the engine. We hope to almost not need the engine anymore. We also installed a new bowsprit system and few other details that will hopefully make the boat a bit easier to sail single-handedly and go faster, as well”, said Boris just before leaving the dock in Lorient La Base and settings sails for the first time this year. Sea trials will continue in the next weeks and soon, the racing will begin. Without doubt, it will be a very lively year!